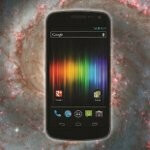 Earlier today, we got word that Fry’s Electronics was selling the highly anticipated Verizon Galaxy Nexus for the admirable on-contract price of $220, but at the same time, online retailer Amazon managed to one-up them by pricing it at an even better $200. 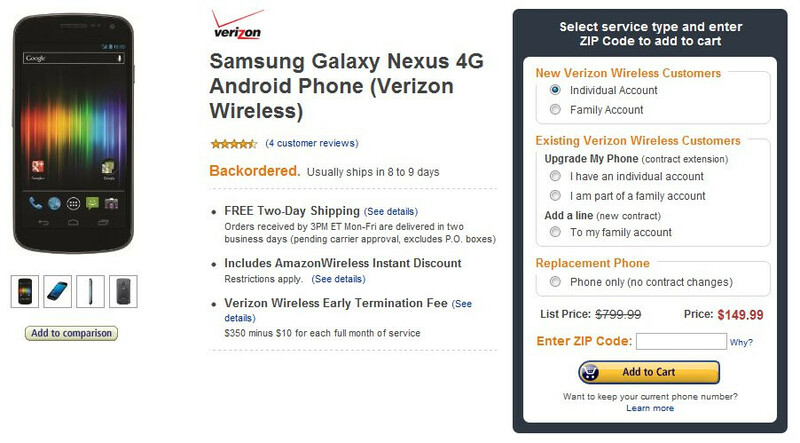 Interestingly, the online retail giant is making yet another leap forward with the pricing for the Verizon Galaxy Nexus. Pointing your web browser to Amazon’s site, they are giving new customers the opportunity to snag the mighty device for the oh-so easy price of $149.99 with a 2-year contract – free shipping included too! However, it’s worth noting that you’ll be spending a good time away from the device considering that it’s currently backordered by 8 to 9 days. Nevertheless, the savings is absolutely substantial, and we’d bet that a lot of people wouldn’t mind the wait. Conversely, upgrade customers still get some love seeing they only need to shell out $199.99 for the handset, which is a ton better than the usual $299.99 they’d need to provide Big Red directly. Therefore, if you’re itching to get the handset and don’t care for the wait, we’d suggest checking out Amazon’s offering. Well LetsTalk is backordered also at that price but at least Amazon was upfront about it. Yep I hate getting good deals on things I want! I demand they charge me more!!!! i can early upgrade now but i'm going to wait til my upgrade in january so i can get it from somewhere else besides verizon, hoping for a sweet deal. $149.99 is what this phone is worth anyway; and what it will be in a few weeks. That price is worth the wait, imo.